Pope John Paul II described faith and reason as being “like two wings on which the human spirit rises to the contemplation of truth, and God has placed in the human heart a desire to know the truth”. Knowledge and the search for truth are an essential aspect of the life of faith. Scripture is replete with examples of individuals who are on this search and who try to discern the work of God in the history of creation. It is through these persistent questions that a link was forged between the Creator and creation. 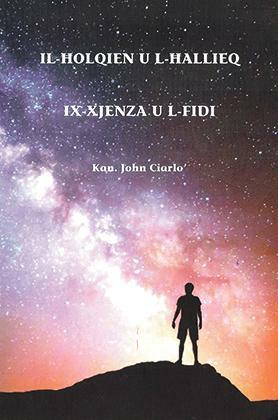 These are some of the themes explored in Canon John Ciarlò’s book, Il-Ħolqien u l-Ħallieq; ix-Xjenza u l-Fidi (Creation and the Creator; science and faith), which is divided into three sections. The first is a collection of articles written by Fr Ciarlò and published in the newspaper Leħen is-Sewwa, the second contains articles written by leading theologians, scientists, historians and thinkers, and the final section includes interviews with renowned scientists on the relationship between faith and science. The author acknowledges that many believe that the concept of belief in a personal God is “problematic”. In the post-9/11 scenario, the question about the relevance of God shifted and deepened. The question no longer revolves around whether God exists or not. Rather, the focus is on whether religion is a force for good or otherwise. Undoubtedly, Richard Dawkins’ book The God Delusion, and ChristopherHitchens’ God is Not Great: How Religion Poisons Everything helped shape some prevailing views on these matters. The basic premise of both books is that belief in God goes against the principles of science and reason. This is somewhat skewed. It also creates a conflict between science and faith, which should not exist in the first place. Fr Ciarlò explains that both science and faith rely on a sense of wonder and awe before a complex and mysterious reality. Ongoing scientific discoveries are a result of intellectual curiosity. Science and religion attempt to explain two realities that can coexist: one through reason purified by faith and the other through the observation of phenomena as they occur. The author appeals for further philosophi­cal questions to complement scientific research “while the reasoned use of science is beneficial and much-needed, this form of reason cannot answer some questions – such as the origins of rationality itself”. The scientific method is also a requirement for the study of scripture. The authors of the Holy Book were moulded in a particu­lar culture and context. In this respect, their experience cannot be adequately understood without knowledge of what shaped their worldview and understanding. There are other facts that prompt men of science to turn towards God. The book includes Abraham Cressy Morrison’s seven reasons for the existence of God, including the mathematical precision that permits life to thrive and the human capacity to reason that goes beyond mere animal instinct. It was this apparent order that prompted C.S. Lewis to muse that “men became scientific because they expected law in nature, and they expected law in nature because they believed in a legislator”. He identifies some parallels between the world of science and the Catholic faith. Both the Church and science cannot be racist in their approach; both strive to understand the truth and both insist that there are laws which are universal. Their work aims at adding value to the life of every individual. Fr Ciarlò’s book is an important contribution both for the argument he raises and the realisation that there are challenges and misunderstandings in the dynamic between the world of science and the realm of faith. When seeing both sides of the debate, one comes to appreciate the fact that both thrive on the same source: doubt and questioning. Without that initial question, the quest can never begin. This book is a worthy read for those who wish to engage with such arguments.